Our ecommerce project has officially kicked off and on Monday 4th January 2016 we began our journey of creating an online retail business from scratch with an aim to launch in just 3 weeks. Showing you how easy it can be and what processes are involved to help you on your own journey. Before we could really get to all the exciting parts of building the store, the first thing we needed was a business idea we could pursue. We know many people have an idea that’s been burning in their head for a long time, and if that’s you, that’s fantastic. For others though, they have the will and passion to create a new business but are not quite sure what the actual business should be. For this Shopify masterclass project we followed this route, mostly because we didn’t have a burning idea we wanted to pursue so had to come up with an idea from scratch. So how have we gone about thinking of an idea and witling them down in the last 2 days…? We kicked started off with just a few sheets of paper and a pen. 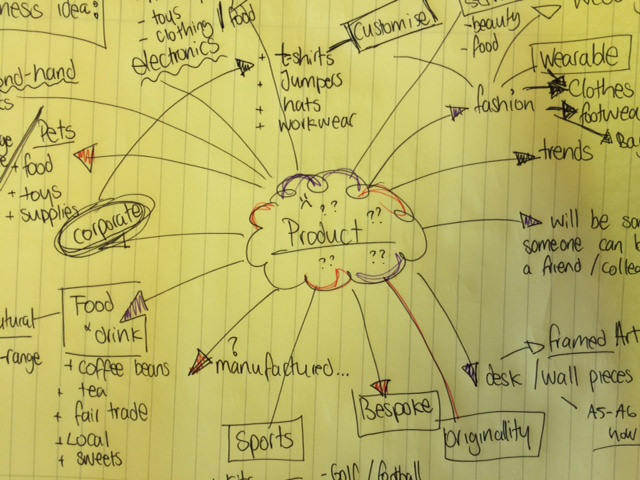 We then began just writing down any ideas we thought could work as an online shop, from selling customised clothing to second hand electronics. We continued to put down any ideas that sprung to mind so we had the widest range of ideas possible to progress with. 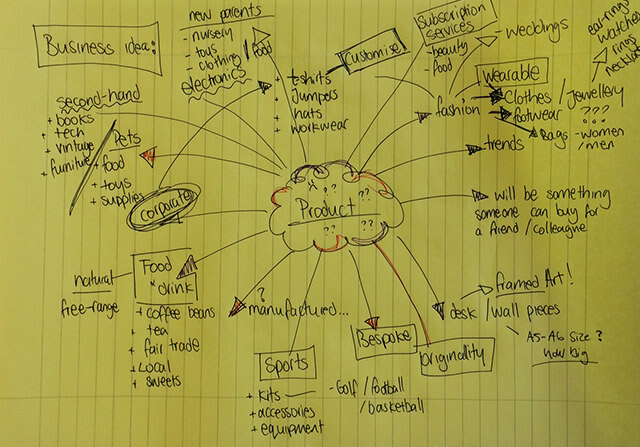 As you can see from the images above of one of our brainstorming sheets we came up with a range of ideas. Some absolutely mad (we have zero knowledge of kids clothing), and some more realistic. This admittedly did take a lot of time to do with pages of ideas and moments of our minds being blank. Now we had three ideas we had to really find the one whereby a real market existed who would potentially want to buy our products. For this we scoured the web seeing what companies already existed within each of these markets and looking to see if they seemed popular. We also did some further general research on the industries to see details on market size, average company size, competition and more. Depending on the industry you look into you’ll find specialist research on that area. We certainly did for each of our ideas. We found websites like www.entrepreneur.com, www.ons.gov.uk, www.startups.co.uk really useful in finding ideas, looking at statistics and general inspiration if you’re stuck for direction (which we were over the last 2 days many times). There are plenty of other resources too, some of which are free, some paid for. For example Keynote (www.keynote.co.uk) have excellent detailed research on all kinds of industries going back many years. Many universities offer free access to Keynote so if you starting up whilst a student you may find you get free access to this really detailed pool of research. If the idea you’re thinking of is focused on a new product/invention then it’s worth checking out the British Library’s Business & IP Centre at St Pancras too. It’s a fantastic free resource and you can get more information about it here. The important thing to remember here is to try and spend as much time researching your idea as possible. As we’ve restricted ourselves to just 3 weeks to launch a new store we are constrained but where possible we’d recommend spending more time to make sure you have all your bases covered, especially if your investing a lot of money into your idea. The next step in our project is to decide which idea we want to go with. We’ll be deciding this tomorrow once we’ve had time to really go through our research again and again. A follow up post will be released tomorrow to keep you informed!